This version has a complete rewrite by Jim Stahler of the rules. There is a slight update to the box. 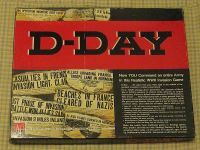 D-DAY, 3rd edition 1977 rules: The revised rules only of our classic D-DAY game are now available mail order only for $2.00 plus normal shipping costs. This set of rules does more than just correct prior ambiguities. It addresses clarity, play balance, and new design techniques in one sweeping change which improves the game 100% while maintaining the game’s excellent postal play characteristics - and all you need to update your game is the rules. Featured in the new version are more realistic supply rules, strategic movements, tactical air power, carpet bombing, strategic fortresses influencing Allied replacements, river interdiction, and much more.